Summer is just around the corner, and you know what that means – bathing suit and shorts season. I’m betting we’re all suddenly a little more conscious of what we toss into our mouths. It’s no secret that My Baking Addiction is full of sugary goodness, but I do try to maintain healthy eating habits. Although I could certainly stand to lose some unwanted pounds, I try to eat in moderation. I typically eat a healthy breakfast, followed by a reasonable lunch, but my downfall is about 3:30. It’s when I’ve finished the work day and am settling in to my evening routine of blogging, laundry and preparing dinner. It’s the time of the day when not only do I get a little crabby, but I also get a seemingly insatiable craving for ridiculously sweet items like soda, Nerds and Fruit Roll-Ups. Don’t judge me, I have a full on addiction to Fruit Roll-Ups, they’re my vice. I love them. If you have read My Baking Addiction for any length of time, you may be aware that I am not all that into chocolate. It’s not that I don’t enjoy it, it’s simply not my favorite. I’m more of a fruity type of girl that has an affinity for all things sour and chewy. Recently, I started hearing good things about dark chocolate on talk shows. Ya know, one of those days when the TV was “on”, but I wasn’t really watching. It piqued my interest, so I started doing more research. Did you know that studies indicate that dark chocolate can do some pretty awesome things like improve your mood, stimulate endorphin production and it’s a great source for antioxidants. I can certainly use an improvement in my mood from time to time! With all of the benefits, it certainly doesn’t hurt to work a little dark chocolate into your diet or your baked goods. These homemade granola bars are full of delicious flavor and have some pretty healthy ingredients like wheat germ, cherries, almonds and of course, dark chocolate. They couldn’t be easier – everything is made in one bowl…bonus! And they are the perfect 3:00 pm pick me up or little surprise snack in the kiddos’ lunch. 1. Preheat the oven to 350 degrees F. Line a 9x13 inch baking pan with parchment paper. 2. In a large bowl, mix together the oats, brown sugar, wheat germ, cinnamon, flour, and salt. Make a well in the center, and pour in the honey, egg, oil and vanilla. 3. Mix well using your hands, add in cherries, chocolate chips and almonds. Pat the mixture evenly into the prepared pan. 4. Bake for 30 to 35 minutes in the preheated oven, until the bars begin to turn golden around the edges. Cool on wire rack for about 30 minutes before cutting. Do not allow the bars to cool completely before cutting because they will crumble. - Store granola bars is airtight container for up to three days. 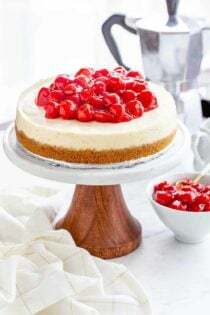 - Recipe adapted from allrecipes. For the chocolate chips, I advise the drops from Nestle, Ghirardhelli or TCHO. I’m saying this because you should avoid the Hersheys’ version. I am actually really liking the new ones from Nestle. I don’t think I have ever used the Hershey’s chips except the cinnamon. These sound lovely! Great idea for a snack! These look so much better then store bought! So delicious! Mmmm. Those look perfect! I might have to make these. These look so good! My husband loves to snack on granola bars, I’ll have to try these. Sounds good..when you say rolled oats do you mean Quaker Oats? Healthy and sweet. It’s a win-win! 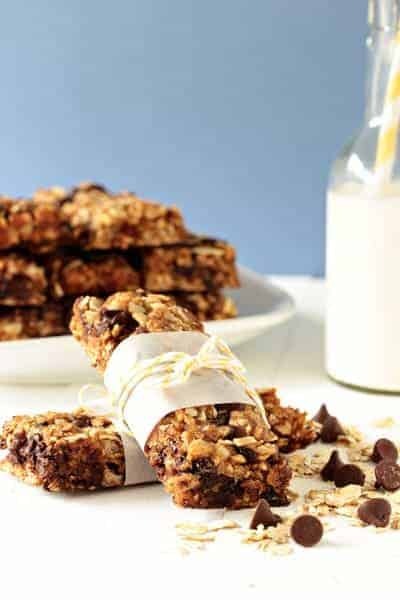 Ohh yum..I love a good homemade granola bar! I appreciate your recipe but is there a way to add more fiber and protein to the recipe. I find that most recipes for granola bars have (usually) too much sugar and fat and not enough fiber and protein. I did an analysis of this recipe and it contains 170 calories, 8 grams of fat, 1.6 grams of fiber and 3.3 grams of protein. While these might constitute a somewhat healthy snack, I would want more oomph of nutritional benefits for my snacking, let alone a breakfast treat. Thanks! The beauty of this recipe is that it is easily adaptable to meet your flavor and/or nutritional needs. I was not focusing on the protein content, but I am sure there are ways to up the protein. Clearly judging from my blog you can tell this is by no means a “diet” site, I was simply offering up a new recipe that is a little better for you than the typical cupcakes or brownies that are found on MBA. Thanks for stopping by. I cut the brown sugar to half a cup, substituted ground flax for the wheat germ, and substituted quinoa flour for the regular flour. The results aren’t quite as tasty as the original, but they do the job of upping the protein (and also make them gluten-free). Even without these substitutions, they are a delicious and nutritionally preferable alternative to the store-bought variety. I am so happy to hear that you enjoyed the recipe – your adaptations sound absolutely perfect. Thanks so much for stopping by and leaving your feedback! Have a great day. Love that this doesn’t contain butter! I’ve been craving oatmeal like crazy today and your bars have not helped the situation! Gosh, they look so chewy and delicious! Mmm I LOVE granola bars, I have them pretty much everyday. The only thing is though, is that they are packaged and I’ve been craving homemade granola bars for the longest time. Bonus on the chocolate. Dark chocolate has always been my favorite. We LOVE dark chocolate cherry granola bars — they are made at least once a month :) These bars look tasty, although we’d have to leave out the almonds. All of your photos are amazing. I have wanted to make granola bars for kid snacks but did not have a recipe. I think they will love the dark chocolate cherry. Thx! I had no idea granola bars could be so easy. No more store bought for me. Thanks for the recipe. Hi Jamie! I love your blog & have used many of your recipes with great success! My 13 yo daughter has been baking granola bars now for the past month on almost a weekly basis. I had found another recipe similar to yours on a different site & we’ve made a few of our own modifications which is the beauty of a homemade granola bar recipe–you can add or delete according to your taste preference! For instance, the recipe we have specifies dried cherries but we use dried cranberries instead. We also use whole wheat flour & add a couple of tablespoons of flaxseed to up the fiber content. The bars freeze really well & it just takes a few seconds in the microwave to defrost which also tends to melt the dark chocolate chips a tad which significantly increases the YUM factor! Thanks again for a great website!! I love homemade granola and granola bars, and am always looking for new recipes to try! I’ll definitely add yours to the pile of recipes to try. I was recently reading the ingredients of all the pre-packaged granola bars, and I wasn’t that impressed. The thought occurred to me that this is exactly the type of snack I should make (I’m not much of a baker). I especially like the idea of dark chocolate and cherries in your recipe. These sound great… I do happen to be a chocolate lover, so I know I’d love them! These look awesome! I’ve been trying out a few different granola bar recipes and have yet to find the perfect one. Will add this to my “to try” list! I just came upon your website now. Do you think that Coconut oil in this recipe would work in place of Vegetable oil? I have experimented with it, but I think it’s with a shot. Let me know how it goes. I wanted to thank you for this delicious recipe, and whoever is taking the food photos did a fabulous job with these bars. Today, for the first time I made meatloaf. I know, not a big deal for most folk, but I am not a fan of meatloaf…at all. I kept telling my husband, as I popped one mini loaf after another into the oven, that I was going to make these bars as a reward. I had gone out and gotten the cherries, gotten the chocolate, I was ready! When it came time to make them, I had my husband sit at the computer and read the ingredients off to me. I popped each one into the bowl. Then he said wheat germ. I went to the pantry, popped open the Tupperware, and discovered it was expired! I was ready to sit down and cry! My husband, bless him, knew how much I wanted to try this recipe, quickly did a search for wheat germ subs, and discovered that as long as it is rough like the wheat germ, just about anything can be used. I quickly grabbed a handful of almonds and pulverized them! In place of the almond slivers I used a 1/2 cup of sunflower seeds. Even with the subs, it is delicious, and I can foresee that this will be made more then once in our household. Thank you! Thanks for a great recipe. I made a few substitutions based on what I had in my pantry and they turned out excellent! :) LOVE your blog. I want to make these for my son for his school lunches. The only problem I see is that there is no way we can eat 24 bars in three days. Can these be frozen? If so, if I take one out in the morning, will it defrost on its own in time for lunch? Or should I toss it in the microwave for a bit? I haven’t tried freezing the bars, but I think the recipe could easily be cut in half. If you try the freezing route – which I think could totally work – definitely let me know. Have a great day! looks great, I am going to do this but instead of making bars, I think before cooking I will lay them out on the pan in small bite size bits. I am sure baking time will decrease. Here is wishing me luck they do not spread out like cookies. No, I have not. If you try it, stop back and let us know how it goes – have a great day! Can I omit the wheat germ? I have everything to make these except that. I do have flax seed though, would that be a good substitute? I haven’t tried this recipe with flax seed. If you do try it, stop back and let us know how they were! I love these! I make them before long road trips as a healthier snack than what you can get at the gas stations. For those wondering, I do substitute ground flax seed for the wheat germ and they come out perfectly. Whipping up a batch today for our long holiday trek to see family. Thanks for sharing! I have made these at least 10 times in the last 6 months. If I had more time I would make them more often. I am really busy so I usually forget what ingredients I am missing…story of my life. This recipe is really adaptable for whatever you have on hand. I wanted to make this without the flour so I used ground flax seed for that and the wheat germ. Yummy! I have also added sesame seeds and sunflower seeds. It’s a nice change. But I have made them several times as written and they are awesome. Thank you for sharing! I share them with other teachers when I am teaching! They all love them! These are super yummy and I can’t stop eating them! All the flavours are there. However, mine seem to be a bit dense than those in the photo and feel a bit heavier than normal (packaged) granola bars. Any reasons why this is happening or is anyone else finding this? The only ingredient I omitted was wheat germ because my grocery store didn’t have any and didn’t know what to substitute it with! Let me know if you have any answers!! Can you make a couple batches and freeze the extra? I haven’t attempted to freeze these but if wrapped properly, I don’t see why this would be an issue. Thanks for stopping by and have a great day! I have made these countless times since I discovered the recipe maybe 5 months ago. I have taken them everywhere from school staff lounge to volleyball games. They are always a hit and they are just delicious and healthy. Thank you so much for the recipe! It is also very forgiving and easily adaptable to whatever diet. I made them as written-delicious. I have also made them gluten free for friends by replacing with whatever I had on hand-ground flax seed. I have added different nuts depending on what I had on hand. I was hungry for peanut flavor so I added a bit to it once. The list goes on. THANK YOU for sharing! My daughter has even converted one of her classmates to eating my bars rather than store bought and she is in 8th! Yay! I love these granola bars. I’ve modified the recipe a little bit to be vegan. I swap the honey for agave, and the egg for 2 tbsp water, 1 tbsp veggie oil, and 2 tsp baking powder. And I make sure to get milk free dark chocolate chips. They turn out great. Also, one time I was out of wheat germ, so I used 1/2 cup of rolled oats ground up in the blender. The taste was slightly different than the original recipe, but still very good. Pingback: Best Summer Snacks | Fit! Live! Win! That’s great to hear! Please come back and let us know how they turn out! Have a wonderful day and thank you so much for following MBA! By rolled oats do you mean the quaker instant oats? Rolled oats are old-fashioned oats. I hope this helps!